Welcome to my Space Is The Place* home page. I have been interested in spaceflight all my life. Perhaps this resulted from my coming of age and developing an awareness of the larger world during the 1960's, when mankind made its first tentative steps beyond our protective Earth, decided that the Moon was the first goal, and BY GOLLY GOT THERE WITHIN THAT SAME DECADE!!! Pretty impressive for someone of my age in those years (i.e. 6 to 16), and proof to me that anything is possible. Mankind's destiny has to be in space. "The dinosaurs went extinct because they didn't have a space program"
- Arthur C. Clarke, science/science fiction writer, visionary and author of "2001 - A Space Odyssey"
My Visits to Space Centres - which are outlined here on the home page and on the second page. My Models of Spacecraft - and some of the history behind them, which is the main topic of the third , fourth , fifth, and sixth pages. This site is dedicated to the memory of my dear friend and fellow space enthusiast Butch Head 1952 - 2005, greatly missed member of the "Baikonour Boys". 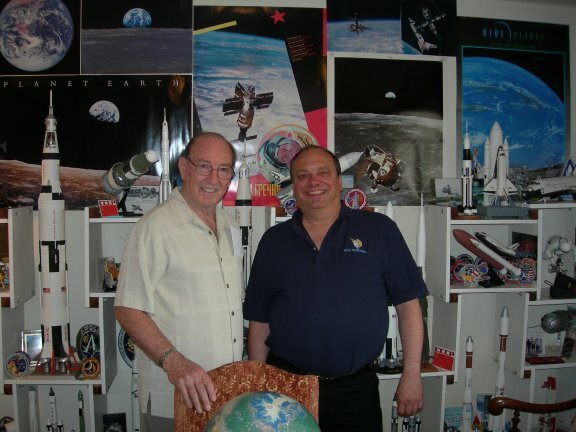 Edgar Mitchell visits "the Shrine" - in June 2006 I was honoured to have Dr. Edgar Mitchell, Apollo 14 astronaut and sixth man to walk on the Moon, visit my home, and in particular the "Shrine" (click to go page 3 with "Shrine" section). 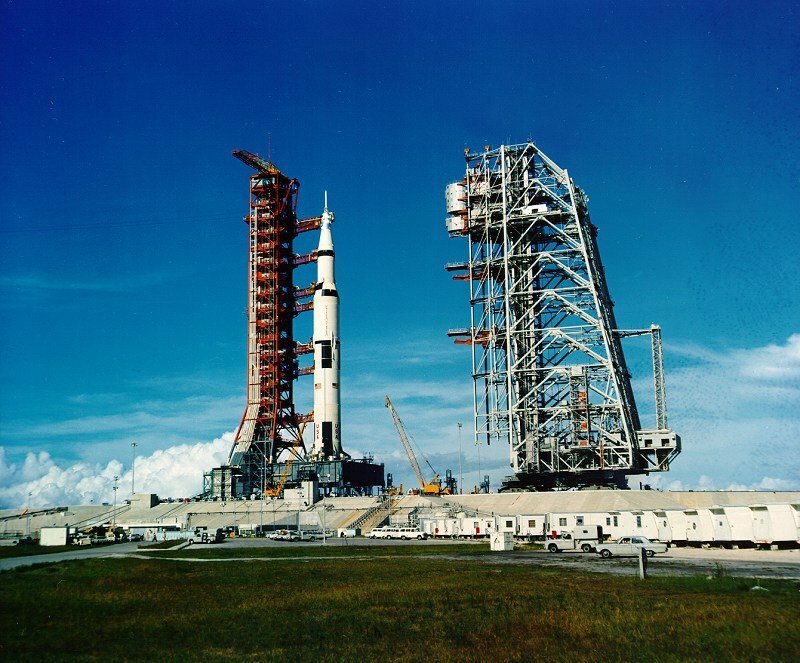 Click here to access Chris' Canadian Space History pages, and here for an interview with Chris about "Arrows to the Moon". 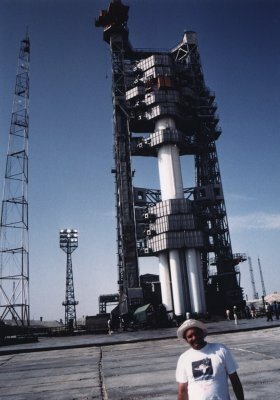 (July 1992) - the once top-secret Soviet/Russian space centre, which is located in Khazakstan in central Asia. (February 1993) - the American spaceport located on Florida's east coast. (November 1993) - the spaceport for the European Space Agency, located in the South American colony French Guiana, in the Amazon basin. (July 1996) - America's west coast spaceport located on the coast of California north of Santa Barbara. (January 2006) - my return to KSC to watch the launch of the first mission to Pluto. 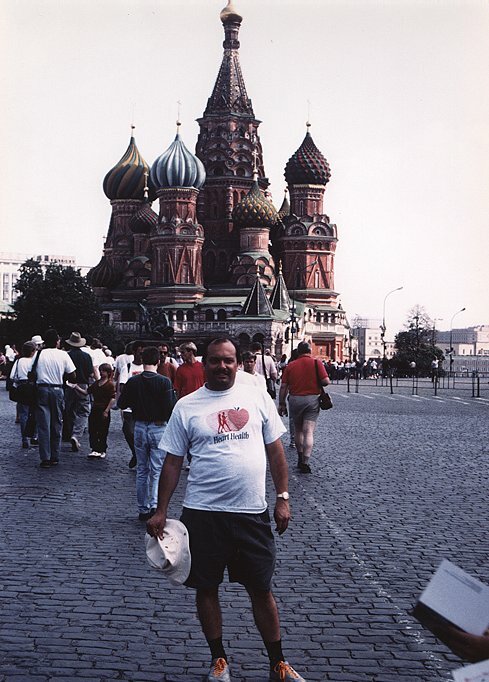 In July, 1992 I toured space facilities in Russia and Khazakstan with a group of 24 people for about ten days. While we did the usual tourist things like see Red Square and the Kremlin, for we "space cadets" the highlight of the trip was a three day visit to the Baikonour Cosmodrome, the once top secret Soviet spaceport on the steppes of central Asia in Khazakstan. 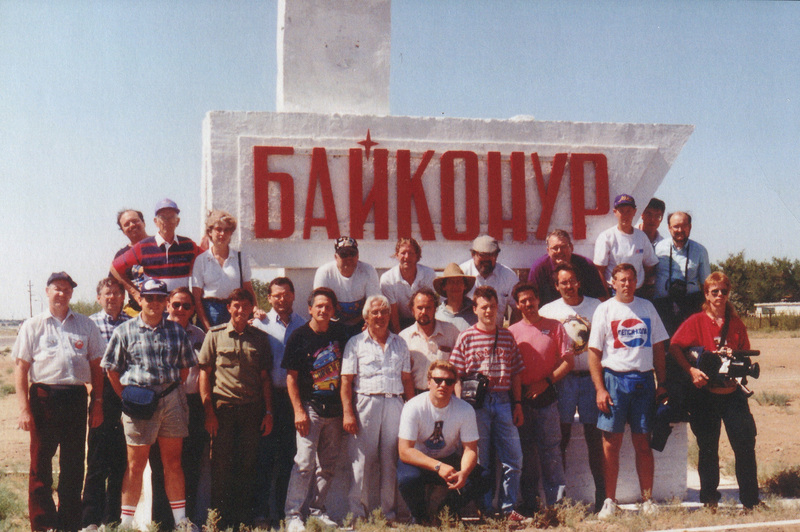 This is a photo of our tour group in front of a sign (in Russian, of course) announcing "Baikonour". I am top left popping my head out from behind the fellow in the red and white striped shirt with a hat. I have become life-long friends with a number of the fellows I met on this trip, the so called "Baikonour Boys". You will see reference to several of them on this site. The high point of our visit to Baikonour was watching the launch of three cosmonauts, two Russians and one French, in the Soyuz-TM15 spacecraft to the Mir space station. To the left is a photo of me standing in front of a Proton rocket on its pad. The Proton is a heavy lift vehicle used, amongst many other things, to place modules of the Mir space station and the International Space Station in orbit. We were allowed incredible access to the facilities in Baikonour. We were taken inside and under the pad that launches the Soviet space shuttle Energia-Buran (video file), then from there right up to the level where the cosmonauts enter the spacecraft. We walked underneath in the flame pit and on top of the historic "Gagarin Pad" from which the first man in space, Yuri Gagarin, was launch on April 12th, 1961. This pad also launched the first artificial Earth satellite, Sputnik (MP3 file audio file), on October 4th, 1957, and thus began the space age, as well as the Soyuz TM-15 launch we witnessed. We toured a number of the buildings at Baikonour as well (see thumbnails below). 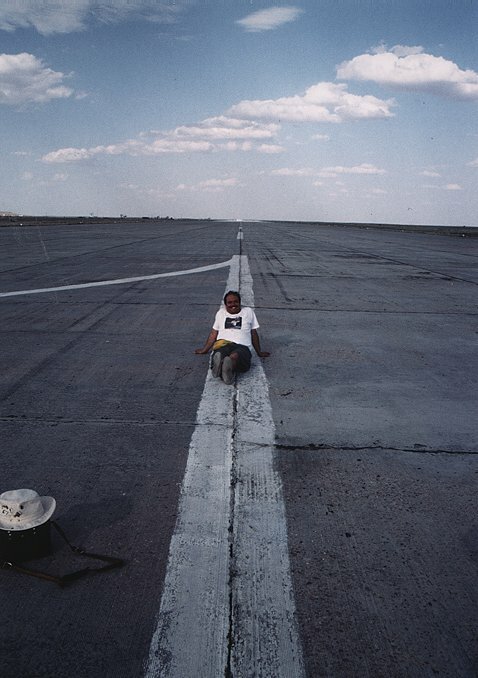 In the photo on the left I am relaxing on the runway in Baikonour on which the Buran space shuttle orbiter landed (video file) after its two orbit, unmanned flight in November of 1988. The Buran only flew in space that one time, and its huge carrier rocket, the Energia only one other time (May 1987). Shortly after developing this impressive capability the Soviet Union dissolved and Russia did not have the funding to carry on with this program. One of the impressions I came away with, especially after seeing the magnitude of the equipment for the Energia-Buran project, was that the Soviet Union had been a poor, almost third world country with a superpower's military and space program. Resource mis-allocation on this scale could only be possible in a totalitarian society. We were back in the Moscow area three days after the launch of Soyuz TM-15 and were in the Russian mission control centre in the Moscow suburb of Korolev (named after the great Soviet chief designer of spacecraft and launch vehicles whose name was a top secret until his death in 1966) to see the Soyuz spacecraft dock with the Mir space station on a live television link. Next to the Russian mission control is the S.P. Korolev Space Corporation Energia Museum, which contains many historic exhibits, including the first manned spacecraft, Yuri Gagarin's Vostok re-entry module. This museum blew the minds of all of us, and is surely on a parr with the Smithsonian's National Air and Space Museum in Washington, DC. However, unlike the crowds one typically finds at the NASM, the 24 of us were virtually the only people in the Energia Museum that day! While in the Moscow area, and before heading to St. Petersburg where our Russian tour ended, we also took in the Yuri Gagarin "Star City" Cosmonaut Training Centre, Monino Air Museum (Soviet Air Force), and the Khrunichev Plant where the Mir Space Station and Proton rockets are manufactured. In late February/early March 1993 I spent eight days in Florida visiting and touring buildings at the John F. Kennedy Space Centre, staying with my friend Ron Caswell. This is undoubtedly the most famous spaceport in the world and is named for the American President who set the landing and safe return of a man on the moon within the decade of the 1960s as a national goal in a speech to Congress on May 25th, 1961 (MP3 audio file). In the photo at left I am standing in front of Pad 39B. This is one of two pads (see also thumbnail below of Pad 39A) built back in the 1960's originally for the Saturn V moon rocket, and refurbished to accommodate the Space Shuttle in the late 1970s. Interestingly, the pad that launches the Soviet space shuttle, Energia Buran, has a similar history, having originally been built to launch the long secret Soviet moon rocket, the N-1. I was lucky enough to have a friend (the late Butch Head) able to pull strings with NASA officials to get a "Centre Director's Gold Pass" (which is what I am holding up in the photo in front of Pad 39B), which allowed us access (when accompanied by Ron Caswell, an engineer at KSC) inside many of the buildings at KSC, including the Vehicle Assembly Building (VAB), the Orbiter Processing Facility (OPF) where Discovery was being refurbished at the time and the Operations and Check-out Building (O&C) - see thumbnail photos below. I am now most thankful that I had the opportunity to tour inside these buildings when I did. In this post-911 world, I am quite sure an "ordinary citizen", not to mention a Canadian citizen, would not be allowed such access. Incidentally, I had originally booked my flight to Florida and vacation to see the launch of the Space Shuttle (STS-55). In the event this launch took place two months late (technical glitches, followed by a pad abort). It was almost 13 years before I returned to "the Cape" and finally did see a launch there in January 2006 (though not a Shuttle launch)..
Click here to continue on to the second page which continues with descritions about my visits to various space centres around the world, while the third , fourth, fifth, and sixth pages display some of my models of historic spacecraft and launch vehicles.